What is an affordable way to advertise in stores and business locales? Our custom printed storefront window clings are a great option that offers other perks, too. These vinyl decals are cheaper than conventional signs and won't take up valuable retail space in shops and showrooms. We are happy to offer custom printed storefront window clings with vibrant UV technology. Where does this process happen? In house on our tech-savvy flatbed printer! That's how we can get your order to you faster than you think. Our clear peel-off signs put all the emphasis on graphics and text with full bleed artwork. Our custom printed storefront window clings are clear so the printing pops! They can also be mounted on mirrors and other smooth surfaces. But the highlight of these vinyl decals is their application. These stickers secure to glass and mirrored surfaces naturally, using only static electricity. The grip is tight and the sign won't fall off. This signage allows retailers and business people to reposition them as many times as desired. Don’t worry if you change your mind about the placement. Our printed translucent sign stickers don’t leave behind "gunk" that you have to scrape. Our signs with static application come in an array of sizes and in a circle or rectangular format to suit your messaging needs. Our freestanding displays draw street traffic inside a store or agency with dynamic messaging. Tell prospective customers on both sides of the pavement what to expect if they walk in! What are vinyl decals typically used for in commercial settings? Custom printed storefront window clings can be placed in prominent areas like a display space or a mirrored back wall at eye level for advertising. This is a subtle yet effective way to reinforce brand recognition because the clear material puts the focus on promotional messaging. Thanks to our UV digital process the images are vibrant and clear. Customers will take notice! 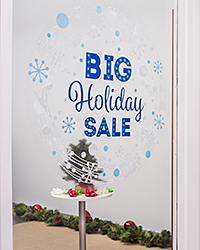 Announce sales, promotions, new merchandise, themed seasonal specials using printed window clings. You can customize any message as long as it fits the size of your background. While subtle, when placed throughout a store customers are reminded of the great deals you’re offering. Give them a gentle prod toward the items you want them to notice. Since this signage is affordable you can buy in bulk so you always have them on hand. Directionals are used in all sorts of commercial environments. Our clings for temporary advertising tell people how to find things. Subtly indicate where a lavatory is, for example. Numerous formats are available for our cling-on stickers are available. This simple design is straightforward. Each of these clings can be placed in seconds, repositioned, or removed as needed. Don't deal with messy signs ever again! Those days are behind you. However, should you need to remove all traces of past residue from older display products before putting up your new clings check out decal application toolkit including a brayer scraper to remove it. Once that's done, it's time to start over with translucent sticker signs and bold messaging. 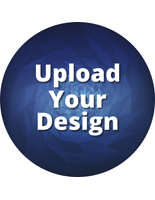 Shop our huge selection of glass-mounted decals at Displays2Go. 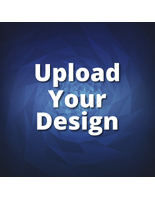 Ask customer care about timelines on customized artwork. 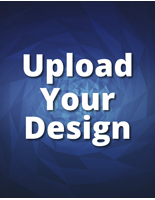 We'll ship those UV graphics to your door, fast! This clear plastic sticker signage is affordable - and that's a good thing for your marketing budget. Promote your organization with our easy-install clings with customized graphics that bring your brand messaging to your customers.